A beautifully designed contemporary home with some of the best views in the entire city. 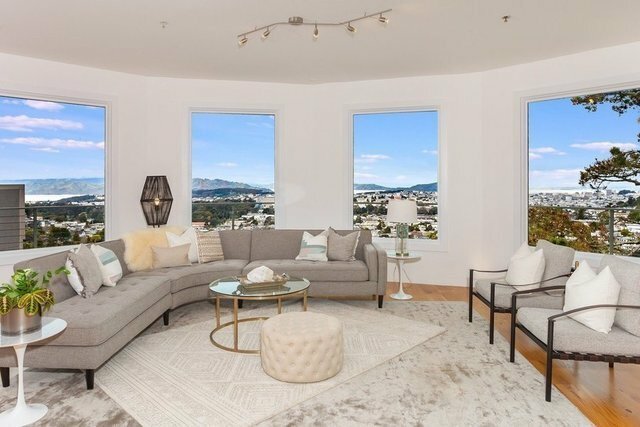 Wraparound windows on three levels showcase eye-popping panoramic views stretching from the Pacific Ocean to downtown San Francisco, including the Golden Gate Bridge, SF Bay, and Angel Island. The dramatic main level features an open floorplan with sweeping views visible from the kitchen, living and dining areas. The lavish master bedroom suite occupies the entire top level of the home, with huge walk-in closets and a separate office. The lower levels include two additional bedrooms, a media room, a spacious family room, and abundant storage. Clarendon Heights is a sanctuary-like retreat in the center of the city, minutes from everywhere, but above and away from the hustle and bustle below. Don't miss this remarkable opportunity!